In a large skillet heat olive oil. Add onion and red pepper flakes and saute over medium heat until softened, stirring occasionally. Add the garlic, cumin and coriander, cooking for 30 seconds, then stir in the cauliflower. Cook for one minute then add the tomatoes including the juice, chicken broth and beans. Salt and pepper to taste. Cover and cook for 2 to 4 minutes until cauliflower is slightly tender. While the cauliflower is cooking, brown the sausage in a separate pan. 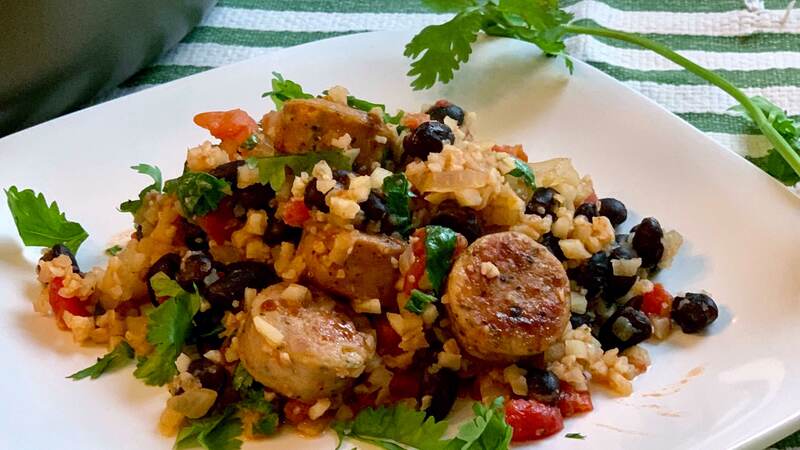 Add the sausage to the mix, stir in the chopped cilantro and serve.